Save money by making sure you don’t waste those tasty holiday leftovers. Need inspiration? I’ve got it. As a child, I loved Thanksgiving leftovers. I would pile stuffing, mashed potatoes, and gravy high on a plate, nuke it in the microwave, and make myself quite happy. Turkey sandwiches, on rye bread, with a thin layer of mayonnaise and some salt were the ultimate. As good as the holiday meal is the second and third time around, sometimes you need something different. Sometimes you don’t have enough of one particular item to feed the whole family. That’s when leftovers need to find new life. You can stretch your holiday dollar by making sure that your leftover food items don’t go to waste. You’ve got about three days to deal with your holiday leftovers before the safety of the food is compromised. Here are some suggestions on how to be a good steward of your resources. If you don’t have the mental energy to deal with Thanksgiving leftovers, package them well and stash them in the freezer. You can buy yourself some time later when you’ve got more motivation to make best use of them. I know that using the leftover carcass for stock is a tasty and economical way to get something from nothing. But, sometimes I’m just too tired to look at that bird again. I’ve frozen the bones to make stock later. This is a great way to have things both ways. Enjoy the holiday weekend, and still make the most of what you have. 2. Make individual “TV dinners”. 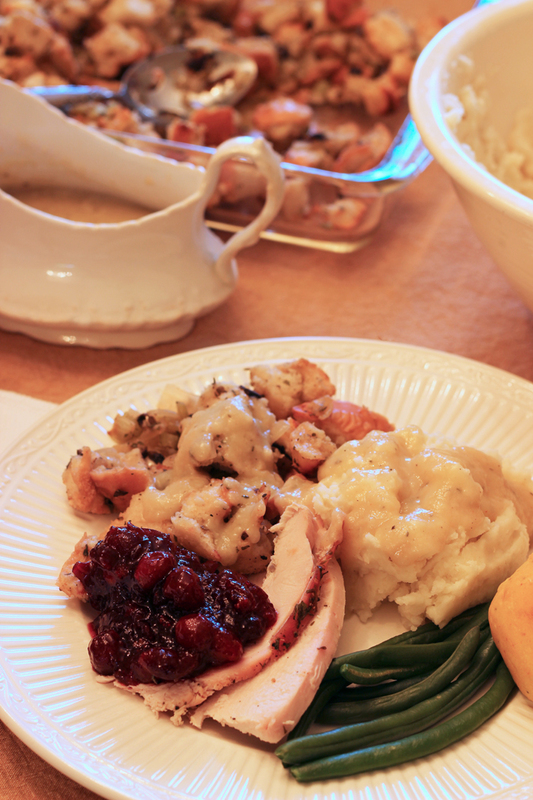 Lay out several freezer safe dishes and prepare a number of “TV dinners” with your leftovers. Chill well before freezing. Now, you’ve got a number of quick lunches and suppers for those busy days and nights when you don’t want to cook. If you’ve got bones, make stock. It’s so easy, you’ll laugh. 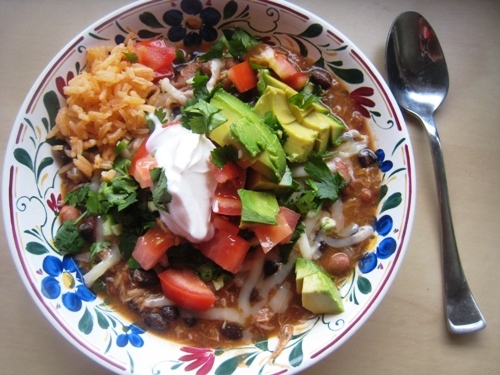 Use the slow cooker for even greater ease. You can use the stock right away or freeze it for later use. 4. Cook up a pot of soup or chili. You’ve got your stock. Chop any leftover meat and stir up a pot of soup or chili. Depending on the flavor profiles in your mashed potatoes and gravy, those can also be whisked into soup where they add fantastic flavor. The potatoes help thicken the soup as well. 5. Make a pot pie. Pot pies are a huge favorite at our house, particularly this one. Thanksgiving is the ideal time to whip up a few and stash them in the freezer. You’ve got all the fixings: pie crust, turkey, vegetables, and gravy. 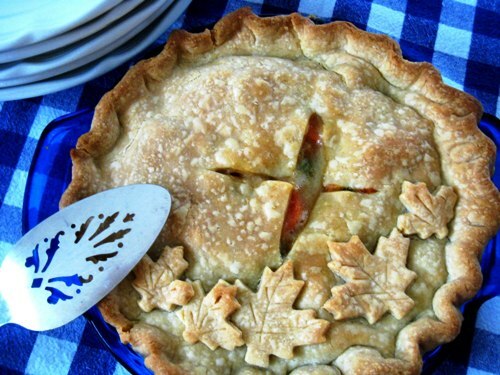 Freeze the pie before baking and you’ll have an easy supper later in the month. I’m always amazed at how far I can stretch our grocery dollar when I make sure not to waste the food we already have. Leftovers are not a bad thing! They actually are a sign of our great wealth. Enjoy your leftovers this weekend! What do YOU do with holiday leftovers? Make Your Pantry Work for YOU! For the pot pie instead of using pie crust use your leftover stuffing for the bottom crust and leftover mashed potatoes for the top crust! Just pat the leftover dressing into a buttered pie pan or casserole dish, brown in the oven, then fill, top, and bake! @Sarah Cassill, thanks for the great idea! @Sarah Cassill,sounds very tasty going to try this idea…thanks for sharing! @Sarah Cassill, Are you the Sarah Cassill I knew from Cleveland Heights? We make turkey chop suey with the turkey thats left over after a couple days of turkey sandwiches. M’honey sautes lots of celery & onions, and then he adds lots of turkey or chicken stock, adds loads of Chinese veggies, turkey, soy sauce and then thickens it with corn starch. He likes it over rice but I just eat it plain. Its pretty yummy. turkey soup, turkey enchiladas, turkey salad, turkey chili, turkey omelets and everyone’s favorite turkey cheese melt sandwiches….yum! Brilliant minds think alike! I’ve got the stock going on the stove. We have our Tday meal around 1 so last night we had a “snack” of turkey, dressing, gravy and rolls. DH and I had big salads with turkey on them for lunch (it feels good to eat lighter today). Tonight will probably be turkey gravy over leftover mashed potatoes and dressing. Tomorrow will be Senate Bean soup with the leftover ham bone. Sunday will be a big pot of turkey noodle soup. Tomorrow I’ll freeze some turkey and ham to be reinvented next month. I calculated my dinner cost last night and it was $60 to feed 9 (8 adults and 1 10 year old that can eat!) and it was under $60. I sent food home with all three of my adult children and can make at least 6 more dinners, I’d say I got a good bang for my buck. I make a stoup in the crockpot. Stock from turkey, leftover dressing, leftover vegetables or pkg frozen mixed vegetables. Coming home from shopping, cold & hugry, can’t beat a nice warm bowl of stoup. I call it stoup because it is thicker than soup & thinner than stew. Another of my favorites is a baked egg cassarole. green bean cassarole, dressing, turkey, & eggs. Mixed together & baked makes great sandwiches.